First of all, my apologies for the teaser. 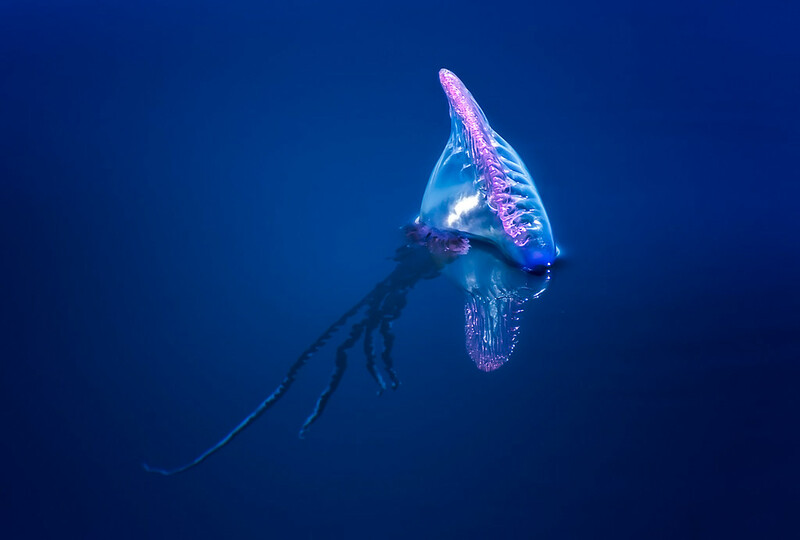 While Portuguese Man o' War (Physalia physalis) can inflict extremely painful stings, they are very rarely lethal. 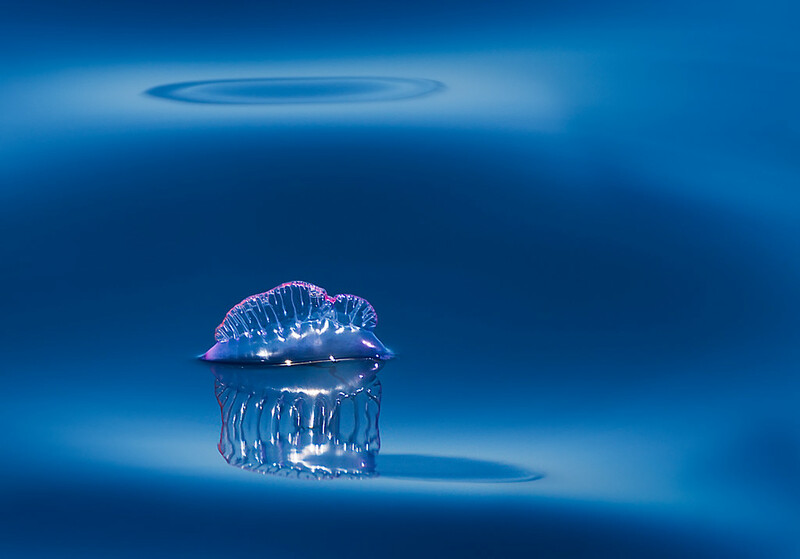 Contrary to popular belief, the Portuguese Man o' War is not a jellyfish. Rather, they are colonial organisms known as siphonophores, which are comprised of several types of genetically identical individuals called zooids, each having its own form and function. Some of the zooids form the tentacles that are used for stinging (dactylozooids), others can digest food (gastrozooids) and a third type is used for reproduction (gonozooids). 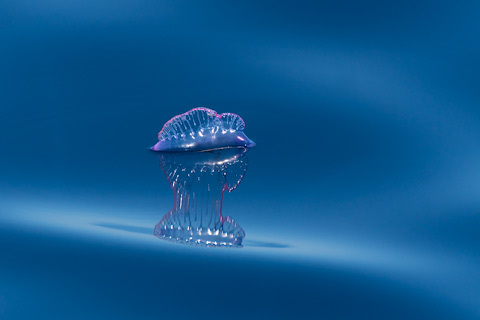 The fourth type of zooid - an overgrown polyp known as pneumatophore, develops into an air-filled bell that allows the whole colony to stay afloat and sail with the wind. All these zooids complement each other in such a finely orchestrated way that the colony behaves as a single unit. 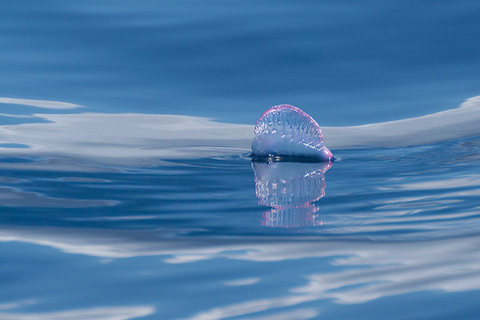 The Portuguese Man o' War is quite an obvious animal to spot on the water surface, making it easily avoidable. The stinging cells, called cnidocytes, are located exclusively on the tentacles and contain organelles known as nematocysts that can fire tiny, venomous harpoons. On the other hand, the gas-filled bell is completely harmless. Most of the concern resides in the length of the tentacles, which can be over 20 metres long, allowing the animals to reach a considerable distance from its conspicuous float. Beautiful and colourful, these hydroids are extremely photogenic and the story I want to tell you is about a series of Portuguese Man o' War pictures I took seconds apart, on the 15th June 2016. That day I was on a Whale Watching boat off Pico Island in the Azores and, while waiting for a Sperm whale to surface, I had about 15 minutes to kill. That is when I noticed some Portuguese Man o' War floating around our vessel. Most of the images I took that day just sat on my hard drive doing nothing. In fact, I ended up with only two keepers. The first one is the shot you have just seen above. It met some moderate success in terms of views on my Portfolio Website and sales as a small print, along with receiving an editor's pick on GuruShots. The second photograph ended up being one of my most successful images ever, as it was commended as Top 50 in the World in the wildlife category by the judges of the Sony World Photography Awards 2017. This image was also picked by the World Photo Organisation, along with other 16 pictures, to celebrate #WorldWildlifeDay (mine is the second image from the top in the linked page, but I suggest you check them all because I reckon they are worth a couple of minutes of your time). While I strongly believe this photograph is far superior to the first one, they enjoyed almost the same number of views on my website. This brings up the following question: can you predict the success of your pictures? The Sony World Photography Awards being the biggest photo competition in the world, award-winning images receive quite a bit of attention. I guess this is why more people that I could possibly imagine asked me to show what the original file looked like. Since the whole aim of me writing this blog is to share my experience, I do not see why I should hide it (although most photographers do not show they original files, often for reasons I fully understand and agree with). Here we go, the original file of my famous Portuguese Man o' War made public for the first time! Apart from being uncropped, I guess we can all agree the original photograph is very similar to the final image. 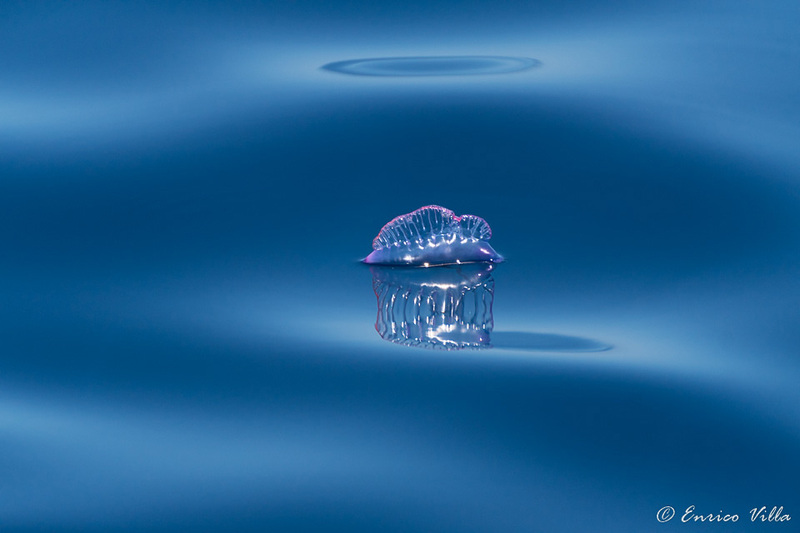 The abstract look of my Portuguese Man o' War does not come from the post-processing. Rather, I happened to be in the right place at the right time. 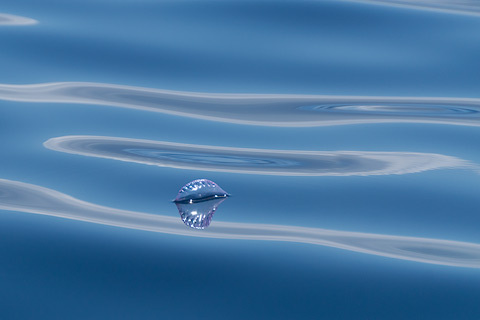 Amazingly smooth seas and tiny, non-breaking wavelets made for the unique double reflection. Some people believe top shots can only be taken with very expensive gear. If you think that using an APS-C camera and third party lenses is going to hold your photography back... well, think again! Nowadays, almost all cameras are good enough to take great shots. What is more important is the subject, the composition and, of course, the photographer. In this case, the perfect composition was there to be captured only for a fleeting moment, literally, less than a second. To my taste, there is nothing particularly interesting about Picture A and Picture B, which were taken 2 minutes before the award-winning shot. Picture C, in the bottom left corner, was taken right after the first two, at 12:54:03. The subject was still too far away from me and, overall, the shot is not appealing. However, you can see how the blue of the ocean at the bottom of the frame was starting to get more intense and pleasing. Promising! After a couple of minutes, I took Picture D, the shot you see at the bottom right corner (12:56:10). 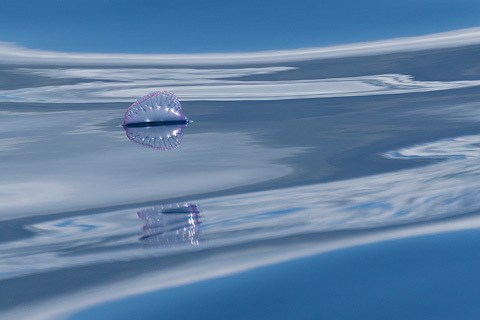 It is quite similar to my top shot, except the second reflection above the Portuguese Man o' War was still missing entirely - definitely a crucial point in favour of the awarded image. Believe it or not (and I swear it is true), the timestamp of my top shot is again 12:56:10, the same as for Picture D. This means things changed and got a lot more dramatic within less than a second! As a further note, all images in this page were taken at ISO between 320 and 800, in shutter speed priority mode at 10 frames/second, letting my camera choose the ISO value within a set range of 100-800. This may help in case you wanted to replicate my results and shows there is no reason to shoot only at ISO 100. In fact, sometimes you should bump the ISO to reduce noise! As for the focal length and aperture, if you are an APS-C shooter, you can use my settings exactly as they are indicated above. On the other hand, if you shoot full frame, do not forget to correct for my crop factor (1.5). For example, an aperture of 5.6 on my camera corresponds to (5.6 x 1.5) = 8.4 on your camera. The same apply to focal length: 300mm on my Sony Alpha 77 Mark II (APS-C) corresponds to 450mm on a full frame camera. There is another article in my blog where I discuss the differences between full frame and APS-C. I hope you enjoyed reading this!